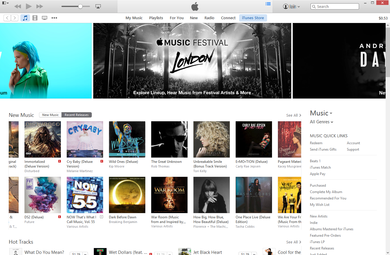 The iTunes Store is a software-based online digital media store operated by Apple Inc. It opened on April 28, 2003, and has been the largest music vendor in the United States since April 2008, and the largest music vendor in the world since February 2010. It offers over 43 million songs, 700,000 apps, 190,000 TV episodes and 45,000 films as of September 12, 2012. The iTunes Store's revenues in the first quarter of 2011 totalled nearly US$1.4 billion; by May 28, 2014, the store had sold 35 billion songs worldwide. While most downloaded files initially included usage restrictions enforced by FairPlay, Apple's implementation of digital rights management (DRM), iTunes later initiated a shift into selling DRM-free music in most countries, marketed as iTunes Plus. On January 6, 2009, Apple announced that DRM had been removed from 80% of its music catalog in the US. Full iTunes Plus availability was achieved in the US on April 7, 2009, coinciding with the introduction of a three-tiered pricing model; however, television episodes, many books, and films are still FairPlay-protected. As of June 2013, the iTunes Store possesses 575 million active user accounts, and serves over 315 million mobile devices, including Apple Watches, iPods, iPhones, Apple TV and iPads.